posted: April 09, 2014 by: Badgerland Veterinary Clinic Tags: "Clinic Specials" "News"
Stop in and meet our many adoptable cats and kittens today! Leafpaw is about five years old. She takes a while to warm up, but once she knows you she won't leave you alone. She is missing her back, left paw, but you'd never know it. She runs and jumps and plays like any kitten! D.C. is a handsome cat who after some warming up will want nothing but love! He loves sitting with you, being pet and at times playing like he is a kitten! 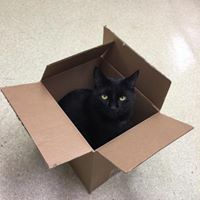 Drake is a shy but sweet cat who needs a forever home. It takes some time for him to warm up to you but once he does you will be his best friend and he will be yours! Drake does good with other cats and loves to play, stop in and see him today! 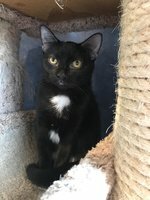 Laverne and her sister Shirley are two young and playful cats that are in need of a forever home. They can be sassy at times but will love you with all of their hearts! They love to play with every toy they can get and will snuggle up when they're tired out!